Adam Smith wrote that man has an intrinsic 'propensity to truck, barter, and exchange one thing for another.' But how did trade evolve to the point where we don't think twice about biting into an apple from the other side of the world? In A Splendid Exchange, William J. Bernstein tells the extraordinary story of global commerce from its prehistoric origins to the myriad controversies surrounding it today. He transports readers from ancient sailing ships that brought the silk trade from China to Rome in the second century to the rise and fall of the Portuguese monopoly in spices in the sixteenth; from the rush for sugar that brought the British to Jamaica in 1655 to the American trade battles of the early twentieth century; from key innovations such as steam, steel, and refrigeration to the modern era of televisions from Taiwan, lettuce from Mexico, and T-shirts from China. Along the way, Bernstein examines how our age-old dependency on trade has contributed to our planet's agricultural bounty, stimulated intellectual progress, and made us both prosperous and vulnerable. 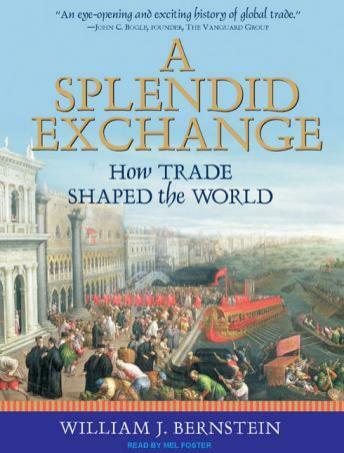 Although the impulse to trade often takes a backseat to xenophobia and war, Bernstein concludes that trade is ultimately a force for good among nations, and he argues that societies are far more successful and stable when they are involved in vigorous trade with their neighbors. Lively, authoritative, and astonishing in scope, A Splendid Exchange is a riveting narrative that views trade and globalization not in political terms, but rather as an evolutionary process as old as war and religion-a historical constant-that will continue to foster the growth of intellectual capital, shrink the world, and propel the trajectory of the human species. I can't imagine all the research that must have taken place to write the breath and depth of this book. I had no idea that trading and commerce between different people's took place so long ago. Very, very interesting historical information that brings you right up to today. If you like history, you'll like this book, and the narrator did a great job. The author's presentation of the socio-economic evolution of those countries on the Indian Ocean and later the Atlantic is comprehensive on its subject and while it does not contradict the established history taught in this country, it certainly fills in some of the gaps western christian historians might see as less than ideal.